Yours, Mine, Ours: Clarifying Decision Boundaries - esther derby associates, inc. 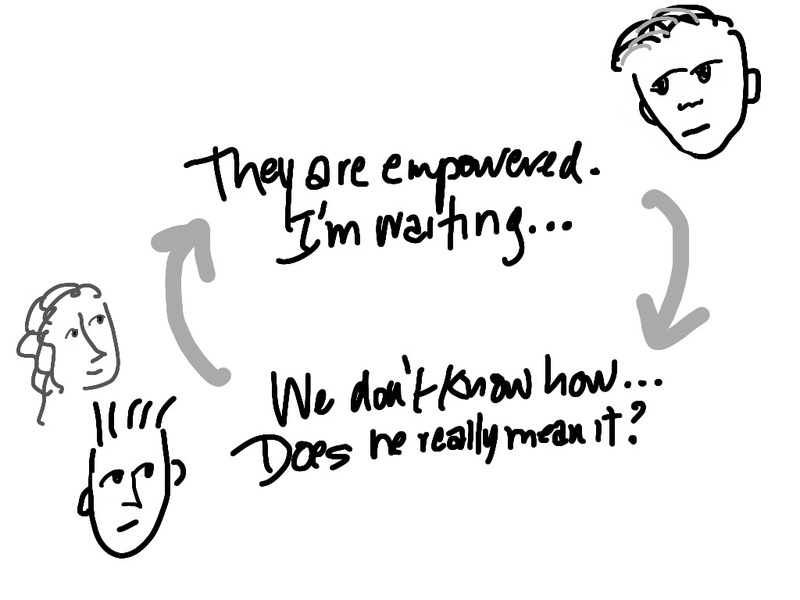 I recently talked to a group that’s forming a new “change leadership” team. Part of the work of the team is improving the organization, and part is capacity building. Four of the people on the team are folks with technical backgrounds who are viewed as having potential to be future leaders in the organization. The fifth person is a manager. By definition, the manager will have a different role on the team. Because of his role in the organization, he’s accustomed to taking a broader view of the organization. He’s got more experience steering change. He’s led and managed teams. He has more authority, and access to resources. He can approve expenditures. One of the tasks for this group in becoming a team is to clarify the managers role, and identify decision boundaries. This is something I do with self-organizing teams. It’s especially important when the manager sits on the team. I find that it helps both the manager and team members break out of the common “looking up/looking down” dynamic. And, the act of co-creating the relationship helps build trust. It’s not necessary to list and delineate every decision that could possibly come up. Usually, there are classes of decisions that can be treated in the same way. I start by having the group brainstorm all the decisions they are likely to make as they work towards the team goal. Then, they group the decisions to identify the classes. Who defines the problem or issue? Who evaluates chooses among options? Who implements the chosen option? Who evaluates the decision, once it’s in place? 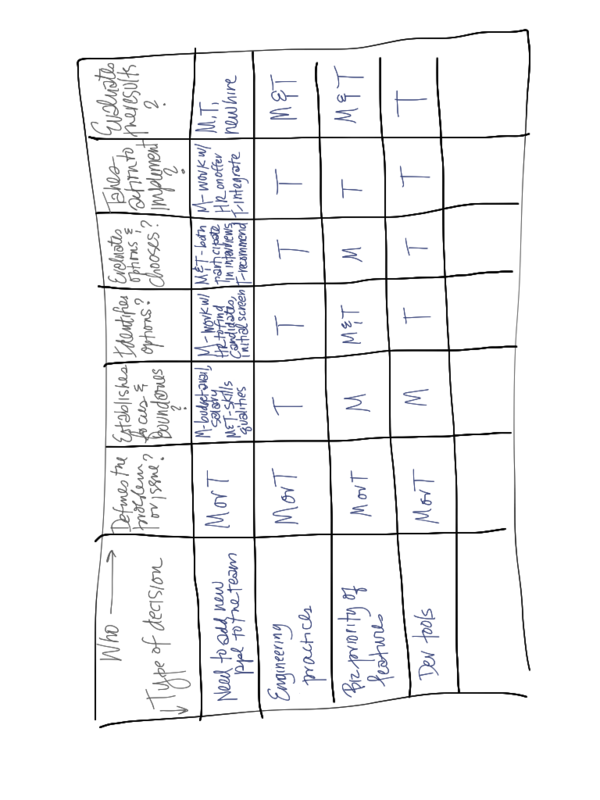 At the end of the activity, they have a grid that looks something like this chart (though they usually have names, rather than M and T to stand for manager and team). Clear decision boundaries makes it explicit which decisions are the managers alone, which are the managers, but involve the team. 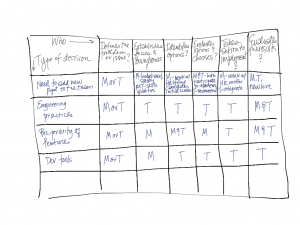 It also identifies which decisions are shared, and which the team can make even if the manager isn’t around to participate in a particular decision. 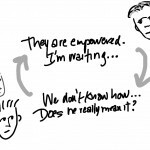 This sort of clarity make is easier for teams to act on their empowerment. It also avoids the sort of ill will that can come up when the team believes they will be involved in a decision, and the person with a management role believes differently. I love it Esther.. your blog posts always seem so timely for situations I am dealing with. I’m going to use this immediately. Thanks! You may also want to consider when an option expires. Also consider the cost of changing your mind if you find the option you have chosen is wrong and you want to switch to another option. Interesting points. And in many organizations, these issues fall under advanced topics. The “expiration” issue comes up under constraints, cost of switching may come up under evaluation. Cost of switching might be interesting as a constraint…and it’s often unknowable.